Canine Companions will be breaking ground on their new state-of-the-art campus in the North Central Region on April 3, 2019. This campus will be located in New Albany, OH and will serve 14 states. The North Central Region has outgrown their current, 7,880 sq. ft. training center. In 1987, the North Central Region became Canine Companions second established region, outside of their headquarters in Santa Rosa, CA and has matched over 1,100 people with their perfect four-legged partner. The current training facility opened its doors in 1990 and little has changed since. Click here to watch the live stream below of the ground-breaking ceremony via Facebook. 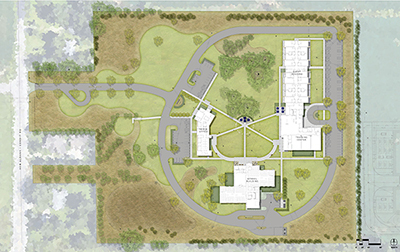 Allowing Canine Companions to serve more people than ever before, this new 16+ acre, state-of-the-art campus, will have over 54,000 sq/ft dedicated to furthering Canine Companions mission of providing expertly-trained assistance dogs to children, adults and veterans with disabilities - free of charge. The North Central Region is the last of Canine Companions six regions to not offer free, on campus, accommodations to recipients coming to be paired with their new assistance dog. It costs those that live in the North Central Region, an average of $2,000 to stay in a hotel for two weeks of training learning to work with their new assistance dog. This new campus will offer our future recipients accessible on campus guest rooms, an accessible kitchen and fenced in outdoor spaces to exercise their dogs - all free of charge. Thanks to support from the Canine Companions community across the country, this much needed campus is becoming a reality. With over $13 million raised towards a $21 million goal, construction has begun with a goal of opening doors at the end of 2020. 16 accessible guest rooms with individual fenced in areas.